Why Aren’t You Shopping Around for Your Mortgage? 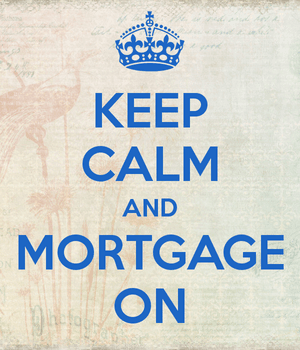 I’ve got a bone to pick…it seems you aren’t bothering to shop around for your mortgage? Instead, you’re just going with the first lender you come across, for better or worse. This is according to a new survey from the Consumer Finance Protection Bureau (CFPB). The agency claims in their National Survey of Mortgage Borrowers that nearly half of those who take out a mortgage to purchase a home only “seriously consider” a single lender or mortgage broker before applying. Equally troubling is that the mortgage borrowers simply rely on information from a lender/broker, followed by their real estate agent, as opposed to outside sources, such as websites, housing counselors, family/friends and so on. It makes me wonder why I bothered creating this site. If you’re not going to take the time to learn about mortgages or shop around for the largest purchase in your life, I’m concerned. But do take the time to comparison shop for your toaster. That’s important. As you can see from the graphs, an overwhelming number of consumers only considered one candidate. 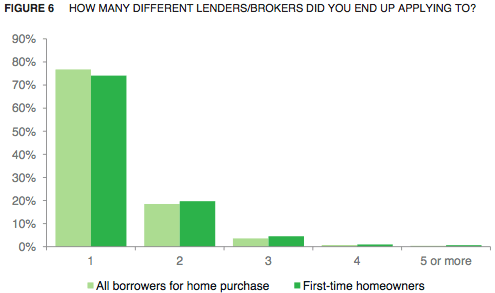 And an even higher number (~77%) applied with just one lender. 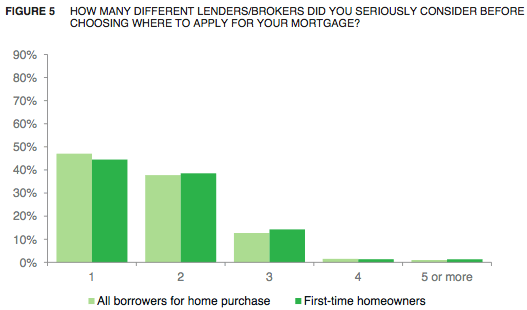 Interestingly, first-time home buyers were a bit more shop-happy, though not by much. The good news is that most consumers (51%) indicated that they’re “very familiar” with the loan options available in the marketplace. For those who said they weren’t, they’re more likely to rely on the real estate agent or a personal acquaintance for direction. See my piece on using the real estate agent’s lender for more on that. Those who did shop around indicated that they did so mostly to find better loan terms, such as a lower interest rate and/or reduced fees. Others did so over qualifying concerns, some because of information learned from their GFEs, and of course more still because they were denied a mortgage from a prior lender. 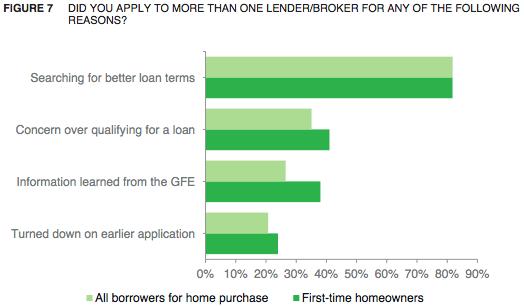 What Are Consumers Looking for in a Lender? This might explain the lack of shopping around. 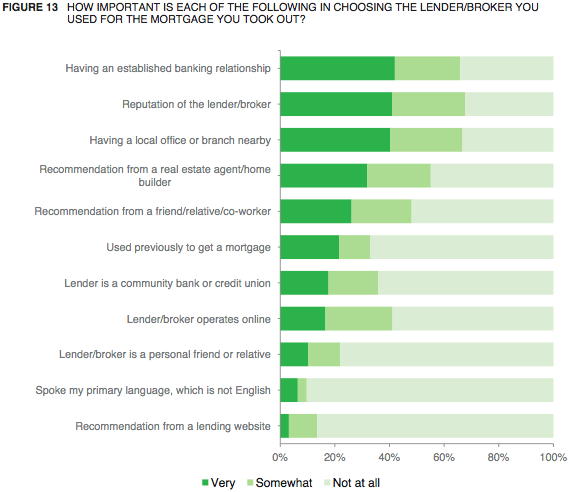 The report revealed that “having an established banking relationship” was the number one reason why a consumer chose a certain lender/broker. While this makes sense, there are a lot of great banks out there that do a poor job originating mortgages. Sure, it’s convenient to use a one-stop shop, but it might not make sense for your pocketbook. And if you use an inept bank or broker, you could miss out on a chance to buy your dream home. So it’s not always the best strategy. Fortunately, reputation of the lender/broker came in a close second, and that’s certainly important if you want to receive a loan approval and a good rate. The takeaway from the report is that a lot of homeowners don’t shop around for mortgages, and the CFPB wants to change that. Today, the CFPB also released a new tool known as the “Rate Checker,” which uses real lender data from Informa Research Services. It’s updated daily to give mortgage shoppers a good idea as to where interest rates should be for a given loan scenario. The CFPB notes that the tool is unbiased, meaning you don’t actually get paired up with any particular lenders. Instead, you get to see the rates lenders are offering most frequently to borrowers based on certain criteria. For example, if you tell the tool you’ve got an excellent credit score and a 20% down payment, it’ll tell you what lenders are typically offering for such a loan. 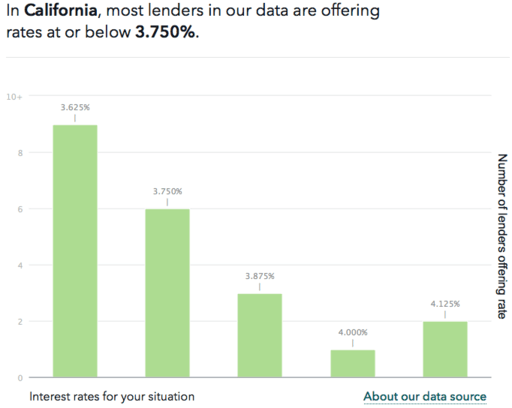 So if a lender tells you they can offer a rate of 4.5% for a 30-year fixed mortgage, but the tool tells you that most lenders are offering 3.625%, you might want to ask some questions. Sure, there are situations where rates could fluctuate based on pricing adjustments. But if the rate you’re offered is way off from the tool’s data, there should be a pretty clear explanation. On a $200,000 loan, a difference in rate of 50 basis points (4% instead of 4.5%) results in nearly $60 in monthly savings. Over the first five years, that’s about $3,500, along with an additional $1,400 in principal paid down. So it can make a pretty big difference. But continue not to shop for your mortgage.